The following is an article that I wrote for the 2007 edition of Llewellyn’s Tarot Reader. “Can someone name one of the bad cards in the Tarot deck?” I often ask beginning Tarot classes this question, and inevitably several hands shoot up. “The Tower card,” one student might say, while another may suggest, “The Ten of Swords.” Other nominees might include the Death card, the Five of Pentacles, or the Three of Swords. Indeed, the list of responses to this question can be quite extensive. Similarly, students can summon up quite a long list of “good cards” if asked for that instead. However, as I tell my classes, this is a trick question, for there are no completely good cards, and none that are totally bad. For instance, some people think of the Tower as a “bad card,” but it also can herald an “enlightening bolt” that will bring us insight from a higher source and free us from an imprisoning Tower of illusion. So let’s look at a way to find “positive” meanings for “negative” cards as well as “negative” meanings for “positive” cards. Actually, there are many ways to gain deeper insights into the cards, but the following technique is especially helpful for finding a more balanced view of them. In addition, it will lead us to a valuable personal development technique, as we shall see later in this article. The first step in this technique is to take a quick look through your deck (or through one of your decks if you have more than one) with the cards face up, briefly considering each one. What is your initial reaction to it? Does it make you cringe? Does it give you a cold feeling of dread? Or does it give you a warm, fuzzy feeling? Does it make you smile? Perhaps it leaves you feeling indifferent, or maybe you don’t care one way or another about it. “Good cards” — Cards that you have a positive reaction to. They may give you a warm feeling, or perhaps you just like them for some unknown reason. “Bad cards” — Cards you don’t like. They may seem dark, disturbing, or sinister to you. In the next few steps we will be working with just one card, but you can come back and repeat this process with any of the cards in your deck. Begin by picking a card from your “good” stack. You can choose the card that seems the “best” of the lot, you can pick the top card in the stack, or you can randomly deal yourself one of the cards from this pile. Once you have chosen a card, take a few minutes to jot down a list of reasons why you consider it to be good. When you have finished doing that, write down all the negative meanings you can think of for this card. It probably will be harder to do that than it was to find positive meanings, but give your imagination free rein and write whatever comes to mind. This is a brainstorming exercise, so don’t censor yourself as you do it. Finally, when you run out of ideas (and don’t stop trying until you have several items on your list of negative meanings), spend a few minutes considering what new insights this process has brought you. What problematic aspects of this card, which you usually think of as “good,” have you discovered? Have you gained a richer and fuller appreciation for it? Do you see it differently now? In addition, you can do this with the cards in your “neutral” stack as well. Although you may have a rather balanced view of most of them, some cards can end up in your “neutral” stack because their meaning perplexes you, making their impact on you either vague or ambiguous. This exercise can shed light on such cards because sometimes it is easier to consider them from one point of view at a time. So far we have worked on learning more about specific Tarot cards. Now let’s turn our attention to a relationship healing exercise that expands upon the steps outlined above. As noted previously, no Tarot card is either totally good or totally bad. Similarly, each of us is a blend of strengths and weaknesses, virtues and vices. However, we often view other people in the same black and white terms that we sometimes apply to a Tarot card. But if we can improve our understanding of a Tarot card using the method described above, shouldn’t we be able to do the same for the people in our lives? With that in mind, I created the following process for healing wounded relationships. The first step is to pick a problematic or difficult person in your life, such as someone you don’t like, you don’t get along with, or who has hurt you. It’s a good idea to begin with someone fairly easy though, since your worst enemy might be too big of a challenge the first time you try this. Next, browse through the cards that you put in your “bad” pile in the exercise above, and choose one that best represents this person or that reminds you of him or her on some level. Again, try to avoid being analytical here. Let your intuition guide you as you glance through these cards until you find one that feels right for this purpose. Once you have chosen a card, consider it just as it is, ignoring for the moment the fact that you picked it to represent someone. Take a few minutes to write down all the positive meanings you can think of for this card. You may jot down any neutral meanings that come to mind as well. However, you can skip the enumeration of this card’s negative aspects, for they will occur to you easily enough all by themselves as you use this technique. Now try to see how some of the positive meanings you just noted might apply to the difficult person you chose. In fact, even your neutral observations can help you find a better understanding of him or her. If you get stuck, you can seek help from someone who knows this person — preferably someone who has a more positive relationship with him or her than you do. However, healing a relationship does not necessarily mean becoming friends with someone we have had problems with. Sometimes it means coming to understand the other person well enough so that they no longer irritate us. At other times it can mean gaining enough sympathy for the person so that we are able to find forgiveness in our heart and thereby release our pain about the relationship. And once in a while, the relationship we really need to heal is actually the one we have with ourselves. This is because the traits that we find most objectionable in other people are often ones that we dislike (and deny) in ourselves. In that case, our problems with another person may indicate flaws within ourselves that we need to correct. In other words, healing a relationship can have more to do with healing ourselves than with changing the dynamics of our interactions with another person. As an illustration of this technique, the following is an overview of how I used it recently in order to gain insights into a wounded relationship I have with someone I used to be very close to. Martha (not her real name) was a person whose religious fervor had led her to become very judgmental of other people (including me). And so, judging my life to be out of alignment with her particular beliefs, she had relegated me to a peripheral compartment in her life. To represent Martha, I chose the Queen of Swords, a card that sometimes suggests someone who is bitter, judgmental, moralistic, or hard-hearted. Then I remembered that occasionally this card is called “the widow card.” This made it even more appropriate since it was after the death of her husband that Martha “found” religion and gained the judgmental streak that had damaged our friendship. So I began by considering the effects of the broken heart Martha had suffered after her husband’s death. If a broken bone is not set right, it may heal improperly, diminishing the strength or mobility of the affected limb, but the problems can be even worse when it is a heart that breaks instead of a mere bone. If a broken heart does not mend properly, the resultant handicap lurks deep in the person’s psyche — perhaps manifesting as a guarded heart. This line of reasoning led me to see how Martha may have acquired a measure of the Queen of Swords’ emotional coldness in order to deal with her heartbreak. And perhaps she needed a rigid moral framework (another Queen of Swords hallmark) in order to regain structure in a life gone to pieces, a structure that could shelter her wounded heart and give it the space it needed to heal. Thus, Martha may have become judgmental because her grief drove her to cling desperately to a strict code of “right and wrong” as if it were a life raft in a storm. Unfortunately, that life raft has become a familiar comfort to her now, so she still clings to it long after the storm has passed. This was a sad realization, and it transformed my resentment into pity. I next focused on applying this card’s positive meanings of insightfulness and self-assurance to Martha. Because of our past conflicts, she seems harsh, distant, and uncaring to me, but perhaps for other people, she is able to provide insights into their problems in order to help them find solutions. Also, through her assertiveness she recently helped someone that I care about make a major life-change. These considerations sharpened my appreciation for those facets of Martha’s personality. Finally, through this process I realized that I too have played a part in our relationship problems. I find Martha’s religious zeal to be judgmental and moralistic rather than spiritual, but whether or not that assessment is valid, it is judgmental, so I am trying to see our conflicts as opportunities for me to work on that aspect of myself. It is still too early to tell if this exercise will lead to a rapprochement in our relationship, but now I have more understanding, sympathy, and compassion for Martha, and our relationship problems don’t hurt me as much as they used to. For now, there is healing enough in that. 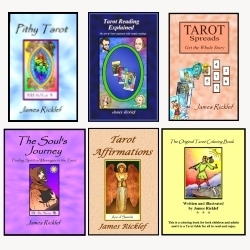 Hello, I am from Turkey, Turkey has limited resources about Tarot and I am interested in with a great love of Tarot, Can you help me please?, I want to purchase your books, you will reply my mail, I will be very happy.